So it’s four o’clock on a Monday afternoon and I’m in a tech rehearsal for the show I’m currently flying (set flying in and out etc. etc.) and this article should have definitely been in well over a month ago. This literally sums up my life and theatre is 100% to blame for this. But would I change it for anything? Absolutely not! I’ve been asked to write this article and tell you all what theatre means to me; and really it’s quite simple – it means magic. I know that sounds a little rubbish and cliché perhaps, but it really is true! Just a couple of weeks ago I was lucky enough to go to the National Theatre to watch their recent production of Treasure Island (a production which clearly had endless piles of money thrown at it), and for the first time in a long while it really made me stop and think – something I really don’t do enough. When you do something day to day it can become very uninteresting and unexciting, especially when it is your line of work, and, although I can honestly say I’ve never once found theatre to be boring, Treasure Island was a fantastic and timely reminder of just why I love and want to continue to work in theatre and the arts. There was a young boy in the audience, perhaps no older than eight, who was immersed in the production right from the start to the finish – every single, magical detail. It reminded me of what sold theatre to me when I was that boy’s age, and it also made me reflect on all the things that I love so much about it 10 years later. Treasure Island at the National. Nowadays I primarily either work on the electrics team or design the lighting for the shows I work with – an aspect of the theatre that is more often overlooked by the average viewer. My all-time favourite quote with regards to lighting shows is ‘90% of the audience are unaware of the lighting but 100% are affected by it’, and it really couldn’t be more true. When the lights go down at the start of the show, 9 out of 10 times you honestly have no idea what it is you are going to see. You don’t know if the curtain will fly out and you will see a single chair on a stage or whether you will see an entire world appear before you which you never thought possible. People go to the theatre to escape and enjoy themselves, and by lighting these shows I get a massive amount of satisfaction in simply knowing I’ve helped people to escape and enjoy their night. For example, I’ve just finished lighting a production of A Midsummer Night’s Dream, and this provided the perfect excuse for me to use my skills to create a bit of theatre magic. The audience entered into a very dark space and suddenly a third of the way into the show they were transported from a room to a forest, and the only way I could show this transition was through my lighting – bit of a challenge, eh?! Through what I do I can create whole worlds, but despite this the experience of the theatre remains one that so many of us take for granted. I mean, where else can you go and spend two hours entirely immersed in what is essentially a lot of people playing dress up? West End productions cost millions of pounds to produce (yes, really!) and night after night thousands of people take time out to pay money to escape the hustle and bustle of their day-to-day lives in order to watch other people pretend to live other people’s life. Whilst it may seem borderline outrageous, I think that the theatre is an absolutely essential part of our society. It keeps so many people happy and provides a unique type of entertainment that nearly nothing else can replicate; not a film, not a festival – nothing is quite like theatre! Now, I’m not saying that it’s better than any other art form (although I do think that…I’m a rather biased source, I know) but what I am saying is that without theatre I really believe everybody’s lives would be a lot more dreary and dull. And that is perhaps why I will never stop loving theatre – or it’s magic. 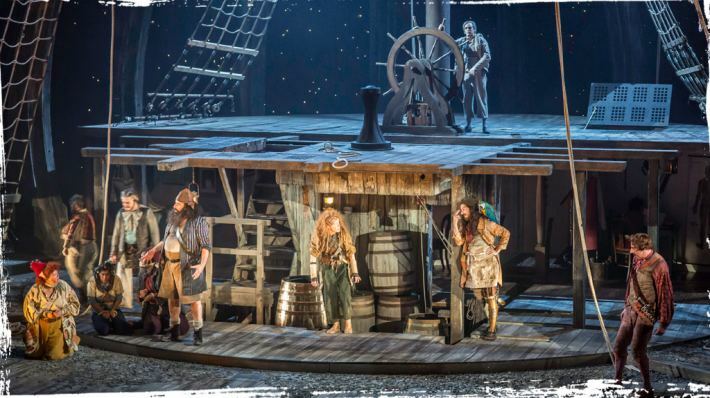 Boats coming out of stages, people appearing and disappearing, flashes, bangs, buildings that look solid when actually they’re made of hollow polystyrene…what is there not to love?! Everybody but everybody loves the magic of theatre. And if they don’t? Well…we don’t talk to those people! Rory Beaton is a Student at The Guildhall School of Music and Drama in London. In his spare time he is a freelance lighting designer and technician. He loves nothing more than having a giggle and a pint at the end of a day (okay, maybe multiple pints), and his biggest food love is lasagna. Above all, he loves spending time and having a laugh with friends – there simply is nothing better! I read this article and found it very interesting, thought it might be something for you. The article is called The Theatre and I and is located at http://prancingthroughlife.com/2015/03/26/the-theatre-and-i/.